Obama beware: Who’s next on the list for Russian jokers Vovan and Lexus? 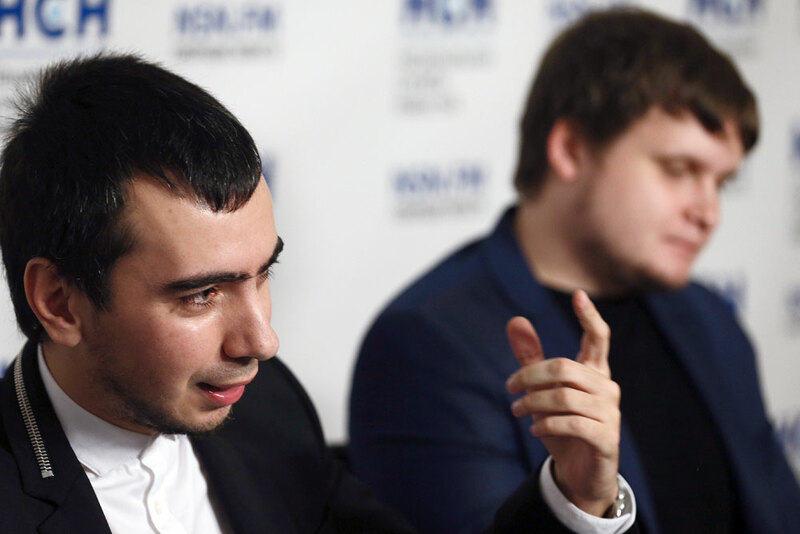 Pranksters Vladimir "Vovan" Kuznetsov (left) and Alexei "Lexus" Stolyarov at a press conference on prank phone calls, 2015. The phone tricks played by Russian pranksters Vovan and Lexus are more than just jokes. By presenting themselves as someone else they are capable of reaching important figures and engaging them in confidential discussion. RBTH speaks to the practical jokers to find out who they intend to call next – having already embarrassed Elton John and Recep Tayyip Erdogan. If your phone rings and picking up you hear, "Hello, this is Vladimir Putin speaking," don’t get too excited – it’s possible that you’re just yet another victim of Russia’s best-known pranksters, Vovan and Lexus. The duo's list of achievements is impressive. Presenting themselves as Putin and his press secretary, they once called Elton John to speak about LGBT rights in Russia. Using the names of Ukrainian President Petro Poroshenko and Prime Minister Arseniy Yatsenyuk they spoke with Turkish President Recep Tayyip Erdogan. Impersonating Poroshenko, they wrote a letter to Ukrainian prisoner of war Nadezhda Savchenko asking her to end her hunger strike – which she did. Vovan (Vladimir Kuznetsov) and Lexus (Alexei Stolyarov) call their activity "prank journalism," explaining that it is a special type of prank: Instead of just making fun of their interlocutor, they obtain unique information. For example, once speaking as Ukrainian officials to the leaders of the Crimean Tatars, who had organized a blockade of the peninsula, the pranksters were able to identify the person who in November 2015 blew up the electricity cables running from Ukraine to Crimea. The pair then gave all the information obtained in their "investigation" to the Crimean prosecutor's office. "In our business you need to be part journalist, part scout. And obviously you need to have a sense of humor," said Kuznetsov. Vovan and Lexus' political pranks are certainly of use to the Kremlin: Their victims are usually those individuals who are in a conflict with Russia. Nevertheless, Kuznetsov and Stolyarov underline that they are just patriots, and while they support Putin's policies, they do not work for the government and find the contact details of their famous victims by themselves or through "friends." They are openly ironic about the rumors of them having connections in Russia's reconnaissance service. On the other hand, they do not want to play jokes on Russian politicians or social figures such as [Chechen leader] Ramzan Kadyrov or Patriarch Kirill, saying this would “lead to destabilization within the country." How do you find the phone numbers of the famous? The pair do not wish to reveal the details of how they are able to phone heads of state, but in general the scheme works like this: They get to the very top through a long chain of people, starting from the bottom. "There are people who are willing to help," said Kuznetsov. Others are contacted blindly, using names belonging to other people. "For example, Saakashvili [former Georgian president, now governor of Odessa – RBTH] helped us find John McCain's number," said Stolyarov. According to the practical jokers, their activity is not politicized. "We don't search for Russia's enemies in order to take a poke at them," explained Kuznetsov. "The most important thing for us is a resonant piece of news." That is why in the fall of 2015 they called singer Elton John, presenting themselves as the Russian president and his press secretary. "John had said that he wanted to speak with Putin about LGBT rights, so we thought that would be a fun idea," said Kuznetsov. However, Stolyarov was keen to point out that there are taboos that he and Kuznetsov would never touch: "You can't make fun of old or sick people. We don’t make fun of and provoke those who we like personally. And we don’t take commercial orders like other pranksters." Vovan and Lexus admit that they would be happy to speak with U.S. President Barack Obama or German Chancellor Angela Merkel. "European and American leaders are top personalities. Of course, this is very difficult and I'm not saying that we are currently looking for their numbers. But we do have the desire to speak to them," said Kuznetsov. Starting on April 30 the pranksters will be working in a new format: The Russian TV channel NTV will host a show called “Zvonok” (The Call) with their participation. In the show the pranksters, having selected a piquant news topic, will call famous personalities and then immediately discuss the information they receive on the air with guests and experts. In accordance with Russian legislature, pranksters who present themselves on the phone as someone else do not violate the law if they do not offend and threaten their interlocutors. There have not been any criminal lawsuits filed against Vovan and Lexus. Ukraine, however, is less tolerant of the Russian pranksters: Lexus says that criminal cases have been brought there against him and his partner.